Marbling Demo: How the Magic Happens! Now in its ninth year, Marbled Art Essentials takes the centuries-old printmaking technique to a new level. Please visit Upcoming Events for an up-to-date schedule. Check back often for newly added shows. Printmaker Sarah Downs practices the age-old process of marbling to create individual works of wearable art that are “born” on the surface of water. After laying down indelible acrylic inks and paints, she manipulates the swirling colors, then dips the accessory, pulling the design off the water. While Sarah first began following the traditional route – marbling paper using such patterns as peacock and French curl – her art has evolved significantly over the past 8 years, including the development of proprietary techniques to achieve specific effects. 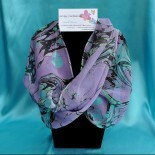 Today, her line of hand-marbled accessories includes three styles of visors (cord-, clip- and Velcro); lightweight, ventilated, adjustable baseball caps; silk crepe infinity scarves; and paper creations. From Maine to Cape Cod to Florida, Sarah has participated in dozens of shows to date. As far as Sarah has seen, no other artist is offering anything similar to her wearable works of art—perhaps one key reason she has had such success. For more information about our products, call 207-985-4499 or email: sarahdowns@gmail.com Please note that this site is best viewed in Chrome. I love the rich combination of colors and patterns created in the marble pattern. Can’t wait for the shows to see more. Have several items for a couple of years, always amazed at how well they wash, still look like new. make great gifts, unique and useful! Marbled Art Essentials – Now on Facebook!